Planning the perfect Valentine’s Day for your significant other? Leave it in our hands! We have put together a range of dining options for you to enjoy the most romantic Valentine’s date at Carlisle Bay Antigua! You and the love of your life, dining by candlelight, as you behold the reflection of the stars in the Caribbean Sea. Can you imagine? Well, you don’t have to. 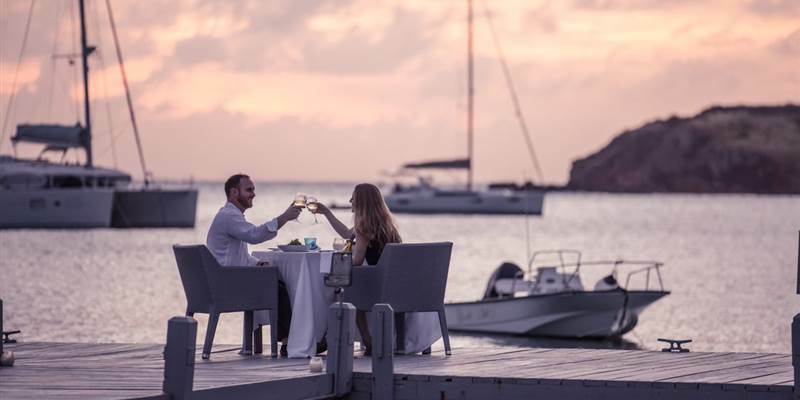 You can now enjoy a Romantic Dinner at the Jetty Pier at Carlisle Bay, a 5 course gourmet menu paired with a 2009 Vintage Dom Perignon, at the very edge of the water. For US$290 per person plus tax. Seating: 6:30 pm. Book at restaurants@carlisle-bay.com or 268 484 0000. Treat your significant other to a mouth-watering 5 course candle light dinner at the beautiful Coconut Grove and fall in love all over again. Indulge in sumptuous dishes and delicious desserts and let the soothing sounds of the waves be the soundtrack of your love story! For US$120 per person plus tax. Seating: 6:30 pm. Book at restaurants@carlisle-bay.com or 268 484 0000. Indulge in a 4 Course Asian feast to enjoy with your significant other. Hold their hands while you take in all the beauty that surrounds you. And after dinner, it’s cinema time! Celebrate this special occasion with a movie screening in Carlisle Bay’s in-house private cinema room. The cherry to top your perfect Valentine’s date. For US$90 per person plus tax. Dinner at 6:30 pm. Book at restaurants@carlisle-bay.com or 268 484 0000. We believe in romance and we think it should be celebrated. If you too, like us, are a hopeless romantic, contact us now on restaurants@carlisle-bay.com to book your preferred Valentine’s date at Carlisle Bay Antigua.